This is a powerful moving mare, using her hocks so well and passing this trait forward. That is no mean feat in todays' world where folks tend to breed for such a level top line that they forget what happens to the positioning of the hocks (too far back). This trait is one that Henry and I, as people that ride our horses truly appreciate. She has big dark eyes full of expression, large nostrils set high with fine outer edges (small details mean the difference in refinement). 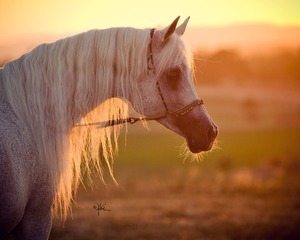 We believe that the addition of the stallion *Jamilll and his dam Hanan, added a touch of outcross blood from Germany to the blood lines in the USA. This infused the already amazing Ansata horses with an extra tounch of special. 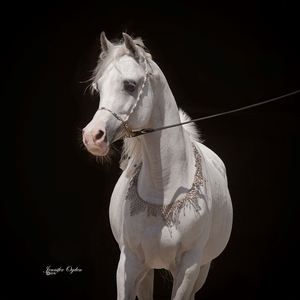 Her sire, Ansata Iemhotep added his blood line of Prince Fa Moniet to further strengthen a great pedigree that is filled with amazing horses. As an individual, Majdiya is so classic in her look, very dry and desert feeling to us, a look that we cherish. Initially, we thought she would work the best with Ali Saroukh but the colt she gave us was not the step forward we hoped for. Next we chose to breed her to Majestic Noble SMF; this was the perfect combination, we have two stellar fillies by Noble. 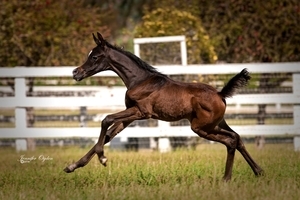 In 2014 we will use his son, Symbolic SMF and see if that combination is also golden!